Compare prices from several car hire companies in Menorca and find the best price for car rental. Our prices always include unlimited mileage and insurance. 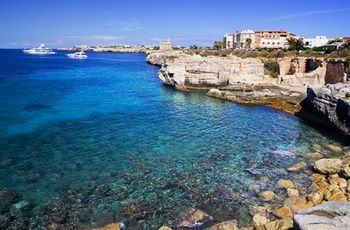 Menorca Balearic Islands archipelago belongs in the Mediterranean Sea off the Spanish east coast. Menorca is the second largest island and is located northeast of Majorca. The population was measured at almost 90 000 in 2006. More and more tourists heading to Menorca, and the typical tourist destination located on the southern coast where there are many beautiful beaches. There has arisen in recent years the typical family-friendly tourist reserves, but if you want to experience the more rugged part of the island, one can travel to the north where fishing villages are located. The main town is called Mahón where also the main port is, and festivals such as Jazz Festival held in Park Es Freginal. Menorca Airport is an international airport located approx. 5 km outside Mahón.